That’s why my Great Dane digs! Danes don’t dig more than many other breeds, but when a Dane digs you notice! The size of the hole a Dane can produce in a couple of minutes is very impressive (or horrifying, depending on your point of view). Digging is normal Great Dane behavior but don’t despair. Understanding the reasons why your Great Dane digs will help identify the appropriate strategy to correct the problem. One of the reasons that can be easily removed, is anxiety. If your Dane is left outside while its humans live life inside, he’ll get upset. Or if he’s left out when his humans go away somewhere and separation anxiety is an issue, digging will often result. When Danes are anxious they need to stay busy – much like a person pacing when worried about something. A Dane needs to be with his family. When he’s not out in the yard, he won’t be digging. But, anxiety isn’t the only condition that might trigger digging behavior. Sometimes it’s just plain boredom! An easy fix to this is to simply ensure your companion has other toys to play with. Our beautiful beasts have an attention span measured in seconds (unless trying to get at food, during which time they can stay surprisingly focused!) – shouldn’t be too hard to get his mind off digging by providing something of interest to him. Chew toys, or even better, a raw meaty bone will occupy his mind for some time. Another reason your Dane might be digging in the garden is to create a comfortable bed. Especially on hot days, a hole is much more comfortable to the Dane because it is cooler. That was the cause for some monster holes in our yard during our first year with a Dane. We’ve had other breeds that liked digging, but those holes were usually to bury something, or to dig something of interest up. We walked out into the yard one summer afternoon (and our Dane had only been out there for 30 minutes) and discovered a hole as big as our growing pup (then about 100 pounds). And he was in it! Danes aren’t shy about liking their comfort. InterestThe other major “digging” motivator is interest. Remember – Danes were initially bred as hunters. If they hear a burrowing animal, or see a mouse disappear in the grass, there isn’t much that will stop them from trying to dig it out! The only thing you can do in this case is remove the Dane. Don’t get too mad at them because they are doing what their instincts are telling them to do. How do you stop digging? Digging doesn’t have to go unchecked. There are things you can do to correct and control this behavior. The first step is to try and figure out why your Dane is digging – it may be an easy fix if these reasons can be removed. If it’s anxiety or boredom, remove the cause of anxiety and give him plenty of exercise, play and toys. If he’s hot, make sure he has a shady spot and of course, lots of water. We compromised a bit and allowed our Dane to dig in only one place. And it didn’t take long for him to understand that. The rest of the yard was left alone and when he had the urge to dig, he goes to one particular spot where he now knows it is acceptable behavior. 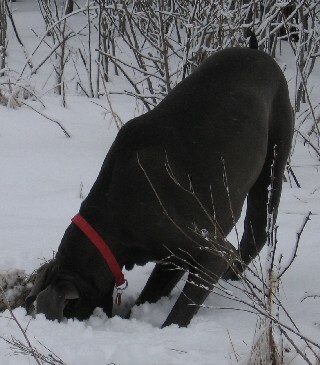 The key to any Great Dane training is consistency and dealing with a digging behavior is no exception. If your Dane is digging, you need to catch him in the act before correcting him. Even seconds later is no good – he won’t know what you are upset about. Constant supervision is required. When he goes out in the yard, stay by the door and watch. As soon as unacceptable digging begins, issue an immediate correction – he must be caught in the act. Then call him over and sit/stay him. Once he does that, give him lots of praise. This praise is for complying with your sit/stay instruction and will help refocus your Dane away from digging. As in all dog training, repetition and consistency will make him understand he’s not allowed to dig. Behavior issues can be corrected. Some Dane owners have reported success by burying dog stools just below the surface so when they dig, they find this and become discouraged. We had no luck with this method because our Dane wasn’t digging in just one spot and even when he found this waste, it didn’t seem tophase him much. Normally, he’d just move a bit! What we did do though was bury bones in the spot we decided he could dig. So he was corrected every time he tried digging in an “unauthorized” spot and when he went to his corner, he got praise and found treasure! It only took about a week to redirect the digging behavior in this way and everyone was happy! Great Danes will dig. It’s natural for them. But if you understand the reasons behind this behavior you can correct and get a Dane that behaves himself in the garden!